The 2017 Maruti Suzuki Raid de Himalaya just concluded at Leh, Ladakh after six gruelling days of rallying. 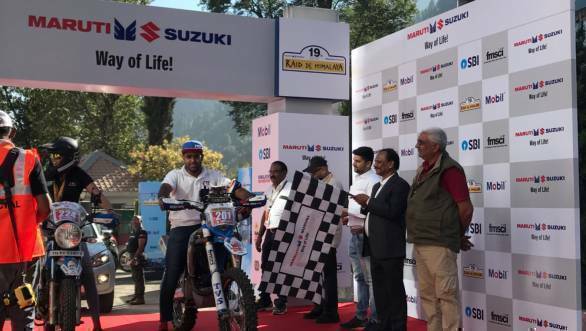 Suresh Rana and co-driver PVS Murthy, of Team Maruti Suzuki Motorsport were crowned winners in the Xtreme four-wheeler category, while Abdul Wahid Tanveer of TVS Racing won the Xtreme Moto class. The 19th edition of the cross-country rally was flagged off from Manali on the October 7 with the stages starting on the following day. Leg 1 took competitors around 200km to Kaza in Spiti Valley via Gramphoo and Losar. The extremely rough 76km competitive section was very tricky and took a toll on both the competitors and their vehicles. In fact, after Leg 2, which took competitors back the same way towards Pang, a majority of the competitors dropped out due to vehicle damage. 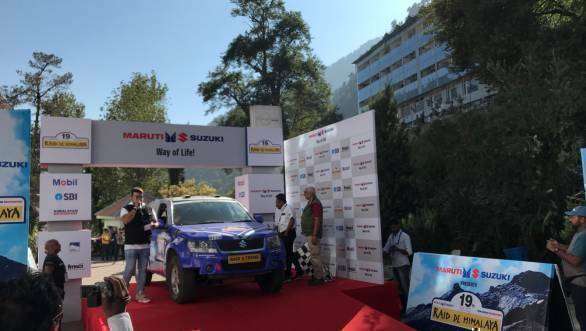 Suresh Rana and PVS Murthy, in their Maruti Grand Vitara, managed to build up a 20-minute lead ahead of Sanjay Razdan and Karan Aukta. In the Moto class, TVS Racing's R Nataraj was 1min 31sec ahead of Tanveer. Leg 3, which began from Pang, took competitors towards Leh, with a detour at Debring for the competitive section. The 53km stage which went up to Daat was quite fast with comparatively smoother terrain. However, navigation played a huge role as some of the sections had wide open spaces with several trails going in different directions. To make things worse, the temperature in the morning was constantly below freezing. The second half of the leg brought competitors back to Debring before moving to Leh. Rana's lead was only increasing as it went up to around 33min. Tanveer meanwhile managed to make good time on these stages, taking a four minute lead ahead of Nataraj. For the next leg competitors made their way to Kargil for two competitive stages from Sankoo to Drass and back. The stages had narrow roads going up steep mountains, leaving no room for error. Suresh Rana continued to extend his lead over Razdan, as did Tanveer over Nataraj. By the fifth leg, only 28 of the 69 competitors that were flagged off, remained in the competition. Leg 5 was one of the toughest stages in the rally, taking participants around 300km towards Penzi La and back via Rangdum. But Rana was still going strong as was Tanveer. The final leg hosted just one competitive stage from Drass to Sankoo, before bringing everyone back to Leh. Rana finished first with a 51min lead ahead of Razdan, while Sanjay Agarwal and co-driver Smitha N finished third. In the Moto-class, Tanveer finished with a 3min lead ahead of Nataraj. TVS Racing's Rajendra RE finished third. In the Adventure category, which is held in a TSD (Time, speed, distance) format, Rajesh Chalana and Satish Gopalkrishnan won the overall Car category while Subir Roy and Nirav Mehta won the SUV class.